With China's booming population and economy, the nation is one of the world's leading consumers of cigarettes. A staggering 47% of men in China smoke, totaling over 300 million smokers worldwide — making up nearly a third of the world's smokers. China is a massive consumer base for cigarettes, and both cigarette manufacturers and the government benefit from this. The national government gleans roughly 7-10% of its annual tax revenue from tobacco taxes. On a local scale, the dependence is much more severe. In 2011, Beijing earned over $75 billion in tobacco taxes, making cigarette sales its primary source of tax revenue. HongTa manufacturing headquarters in YuXi, China. The eight golden cigarette pillars are immediately recognizable as the brand's logo. In smaller, rural areas of China, entire cities are built around tobacco. For example, Yu Xi is a small city inside of Yunnan province, and was built as a manufacturing town for HongTa (Red Pagoda) cigarettes. HongTa's influence is immediately visible in YuXi. The city features a HongTa hotel, HongTa Avenue, HongTa sports stadium, and a HongTa sports stadium. Tobacco's iron grip on China is largely supported by the intimate connection between the tobacco industry and government. The China National Tobacco Corporation (CNTC) is the state-owned manufacturer of tobacco products, and controlled 99.9% of domestic tobacco industry in 2000. Though the CNTC is a corporation, it's part of the central government as the State Tobacco Monopoly Agency (STMA). This means that the CNTC receives funding from the government, and has close ties with government officials. As public awareness of the dangers of smoking grows, cigarette companies has increased their efforts to develop "safer" products. To do so, CNTC relies heavily on universities and research institutions for R&D. However, most research isn't geared towards improving cigarette safety. Most research goes towards making manufacturing and production more efficient. Research on ‘reduced harm’ and health effects has increased from 1% of projects in 1983-1987 to 4% in 2003-2007. 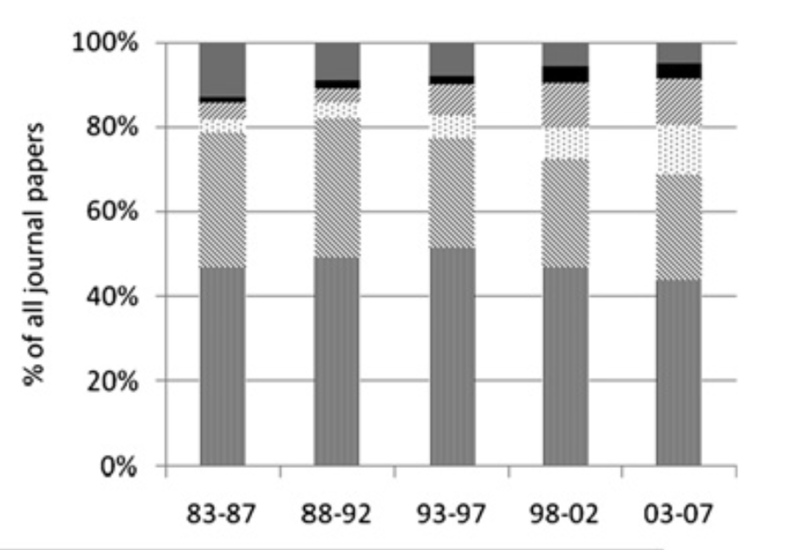 Tobacco companies' influence on academic papers is steadily increasing. This is particularly troubling because the CNTC's relationship with academic institutions violates article 5.3 of Framework Convention on Tobacco Control, which China ratified in 2005. Since its inception, the CNTC has been taking over existing tobacco research, as well as creating branches and departments within universities. 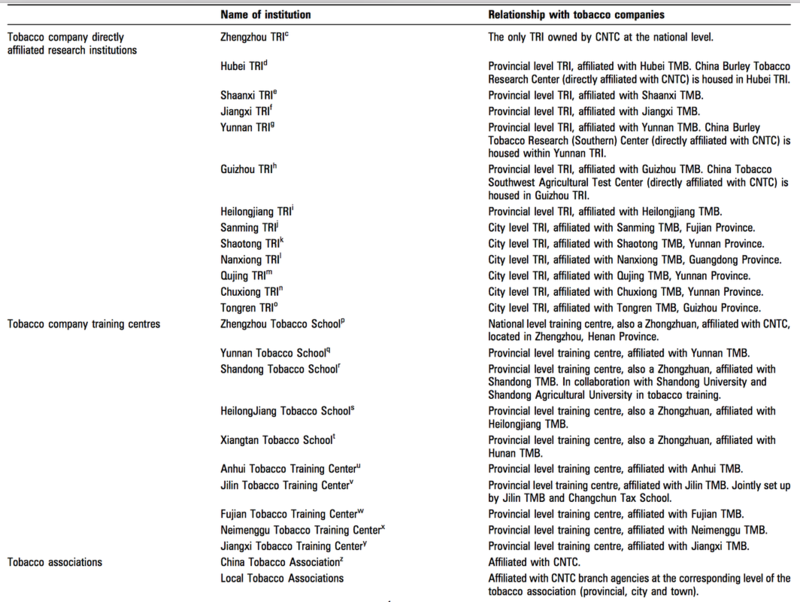 Below is a list of some research and training associations affiliated with the CNTC.